Keep kids' brain muscles flexed with fun learning exercises. This year's Summer Learning Series features 10 Awesome Outdoor Learning Ideas, 10 Fun Indoor Learning Projects, Four Ways to Prepare for College This Summer, and to round out the numbered lists, this collection from Accredited Online Colleges. 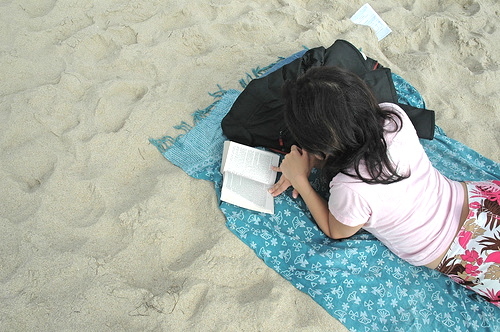 Keeping up with reading and writing skills over the summer is key to maintaining learning throughout the year — so pay special attention to these creative learning activities. Keep a journal: Encourage kids to stay sharp in their writing by keeping a journal, discussing summer activities and more. Find summer writing camps: Older kids can check out summer writing camps, often available through local newspapers. Read throughout the day: Offer reading opportunities morning, noon, and night, with the newspaper, websites, books, magazines, and more. Write a comic strip: Develop creativity, writing, and humor with a fun comic strip. Read books about summer activities: Before heading to the beach or a baseball game, pick out a book that discusses the activity. Email friends and family: Have kids write to friends and family over email to keep in touch while also keeping up with their writing practice. Encourage reading in bed, even if it pushes bedtimes: Allow your children to read in bed, even allowing them to stay up later as long as they are reading. Start a blog: Create a blog for your child to update over the summer, and share it with family and friends. Read everywhere: Read street signs, billboards, and anything else you can find while you’re on the go this summer. Designate a family reading time: Create a time when your whole family reads, individually or as a group. Buddy up: Pick out books for your kids to read together with their friends for fun and a shared experience. Pick up comic books: Build a renewed interest in reading with comic books this summer. Read aloud each day: Even if it’s poolside, listen to your child read aloud every day. Summer reading camp: Scholastic offers a Summer Challenge, a virtual reading camp that engages kids in competitive reading over the summer. Going out and getting active is a great way to have fun and learn this summer. Go to a baseball game: Discuss strategy and scores while taking in a baseball game. Visit museums: Museums often have summer programs for kids, so stop by and check out what they have to offer. Go out to eat: Do menu math at a restaurant, asking kids how much food they can afford with a certain amount of money. Go on tours: Whether it’s a chocolate factory or a glassblowing studio, take advantage of tours so kids can learn how everyday items are made. Camping: Camping offers an excellent opportunity for discussing nature and the world around you. State and national parks: Parks offer a multitude of learning opportunities, and fun family experiences as well. Visit the zoo: Take a family field trip to the zoo to see the animals and learn about animal life. Try these ideas on summer days when you’re sticking around the house. Get crafty: Adopt a daily craft activity to do as a family every day. Build a treehouse: Combine outside fun with construction by building a backyard treehouse, remembering to discuss measurement (and safety) as you go. Create a lemonade stand: The classic lemonade stand offers many lessons in math and business. Play board games: Board games build thinking skills and are a fun way for kids to play and learn over the summer. Track daily temperatures: Fight the summer slide while tracking the summer heat wave by tracking the temperature each day with your kids. Calculate your family’s emissions: Use the EPA personal emissions calculator to discover your emissions as a family, and discuss how you can improve. Plant a garden: Teach kids about nutrition and growth with a summer garden. Count money when playing Monopoly: A family game time with Monopoly can turn into a math lesson when kids act as the banker. Use these websites to have fun learning this summer. Kids Off the Couch: Get a weekly newsletter with great ideas for getting kids out and learning for the summer and throughout the year. Storyline Online: Visit Storyline Online to watch videos of actors reading children’s books out loud. Smithsonian Kids Collecting: Kids can start a collection over the summer with the Smithsonian’s program. Thinkfinity: Thinkfinity has fun games and learning activities for year round learning. These are just a handful of the fun learning activities you can try this summer. Make grocery store visits educational: Think about the grocery store as a great place to practice math skills, and bring that same idea home to the kitchen, too. Build a robot: Find cool and kid-friendly robot projects to take on over the summer. Create a picture journal: Keep your child engaged and thinking about the activities you’re doing this summer by using a camera and notebook to create a picture journal. Create a puppet theater: Make puppets with outgrown gloves from the winter, and create a story for kids to act out. Citizen scientist: Turn kids into citizen scientists this summer, putting them to work as scientific researchers in projects over the summer. Build your own game: Check out projects that allow you to build a game over the summer. Play car games: Play ABC games during long car trips. Map out your trip: Involve your children in vacation planning by helping them create a map for your trip. Programming: Using programs like Scratch and Kodu, even young children can get started on programming over the summer. Finish schoolbooks: Often, school books like math journals aren’t completed by the end of the year-put them to good use and finish them over the summer. Do art projects: Practice drawing, take pictures, or sculpt together, and discuss the meaning of art while you’re doing it. Visit the YMCA: Find a great YMCA summer program for your kids to enjoy. Public library incentive programs: Public libraries often have interactive programs for students over the summer, typically with incentives like pizza or tickets to sporting events. Summer camp: From web design summer camps to ones that promote healthy eating and exercise, summer camps can keep kids active mentally and physically. Summer school: Many school districts have programs targeted to students who need to learn over the summer, so find out if there’s one in your area. Day camp: Camp doesn’t have to be a 6-week sleepover affair to be effective-check out day camps for summer learning activities, too.